Directors Olivier Nakache and Eric Toledano can best be remembered for their bubbly comedy LES UNTOUCHABLES, which ended up one of the mot successful of French comedies. The target this time is an extravagant wedding at a chateau where all the servers have (and forced to wear) valet costumes including white wigs. 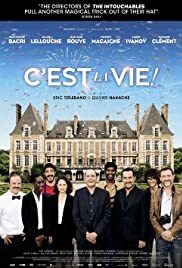 The story is told from the point of view of the the wedding caterer manager, Max (Jean Pierre Bacri) a battle-weary veteran of the wedding-planning racket. He is clearly a working class Frenchman who works in an upper-class environment. This is evident in the film’s opening sequence where he is clearly perturbed at a couple cutting corners to save cost for their wedding in downtown Paris. He freaks out at them before the film settles on his current gig. Max has been running his catering company for 30 years, and beginning to grow tired. While planning a large wedding for clients Pierre and Helena, a series of mishaps upends a very tight schedule, and every instant of happiness and emotion could veer into disaster and chaos. From the preparations to daybreak, the audience gets a behind-the-scenes look at a wedding party through the eyes of the people working the event. Max initially arrives to find everything in disarray. He is short of staff and his employees are fighting. This gig turns out to be a hell of a fête, involving stuffy period costumes for the caterers, a vain, hyper-sensitive singer who thinks he’s a Gallic James Brown (Gilles Lellouche), and the morose, micromanaging groom, Pierre (Benjamin Lavernhe) determined to make Max’s night as miserable as possible. The script includes an assortment of working class workers totally out of place in a wedding of higher society. When it rains, it pours, as James (aka DJ Fab) utters at one point in the film. The electricity goes out, the guests get food poisoning and the groom appears with a list of personal demands, least of which is his very, very long prepared speech. “Sober, chic and elegant is how I want my music,” says the groom to the loud and crass James. Actor Bacri (THE TASTE OF OTHERS), according to the press notes, helped the directors in the script, having experience in that field. Besides wedding ceremony problems, personal problems arise. Max’s personal life comes into chaos as Joisette (Canadian director Xavier Dolan regular Suzanne Clément), seems to have written him off, coolly going about her professional duties while openly flirting with a much younger server. The bride recognizes a waiter as a past fling. The wedding photographer’s son and father relationship is put to the test. This is an ensemble work, which works as there are lots of humour with a touch of social comment. For LE SENS DE LA FETE, the comedic set-ups are funny enough, most of them working and keeping the audience happy with laugh-out loud humour. This is French comedy as the French can do best. And it is a matter of time Hollywood will attempt a disastrous remake. C’EST LA VIE! which was selected at the Closing Night Gala for the 2017 Toronto International Film Festival was named in ten categories, including Best Film, at the 43rd César Ceremony, the French’s equivalent to the Oscars. This is my second viewing of the comedy and the laughs still bring tears to my eyes. Very funny and very entertaining.